What are the top landmarks in Luebeck? Once Luebeck’s first line of defense against attackers, this landmark is now famous for its distinctive architecture and local history museum. An austere façade, elaborate interior and interesting history make this one of the most rewarding churches to visit in Luebeck Old Town. Built as part of the medieval defensive system, this grandiose tower has also been the private residence of notable city residents. Inspect the mishmash of architectural styles of this town hall and join a guided tour to visit some of its elegantly decorated halls. Step back in time and learn more about local history with a stop at Gothmund in St. Gertrud. Amble around the area's waterfront or visit its aquarium. Lubeck City Centre is a neighbourhood that welcomes all visitors. The neighbourhood has many appealing features, among them its festivals and rich culture. Broaden your horizons with some local historic landmarks. Church spires soar high above centuries-old merchant houses, which themselves house cafés, museums and shops, in this historic island district. Ostholstein is a welcoming neighbourhood. Nordwestmecklenburg is a welcoming neighbourhood. The hotel has an inspiring colour scheme throughout, which really differentiates itself from other hotels. It's focus on quality and service is reflected in this together with the staff's friendliness and attention to detail, e.g. The food variety and home-made items at the breakfast table are just fab! The lack of an elevator, which means that suitcases need to be carried up and down the staircases, makes the hotel up by it's high standard of hospitality. I thoroughly enjoyed my stay. The northern German city of Luebeck (Lübeck) was the medieval capital of the Hanseatic League and its UNESCO World Heritage old town is packed with cobbled streets and red-brick houses with steep gable roofs. The nicest accommodation in Luebeck can be found on these narrow thoroughfares, nestled close to churches and the cathedral that dates back to 1173. Old Luebeck was once defended by four medieval gates – Holsten Gate is a notable survivor and a couple of Luebeck’s luxury hotels are near this Instagram-worthy landmark. The St Lorenz district is just west of the old town and is handy for the train station – the four-star H+ Hotel Lübeck couldn’t be closer. Cheap accommodation in Luebeck is often found south and west of the old town. Nearby Travemünde is a district of Luebeck that sits of the Baltic Sea and has an attractive river and beachfront. You can take it easy on the golden sands and in the beach cafés – and it’s here where you’ll find the ferry and cruise ship terminal. There’s enough to keep you occupied for a day or two, and you may want to book accommodation in Travemünde if you're taking the ferry to Scandinavia. 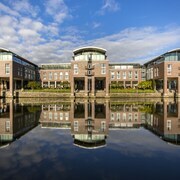 If pottering around historic landmarks is your idea of bliss, then a stay in Luebeck should be top of your bucket list. The jewel in the city’s crown is the resplendent 13th-century town hall that sits in the marketplace. 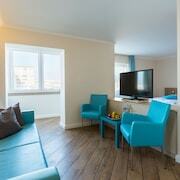 Hotels near Luebeck town hall include Motel One Lübeck, a great-value option. Look out for the twin towers of St Mary’s Church dominating the skyline behind the town hall. The old town boasts plenty of places to stay that are convenient for Luebeck’s engaging museums. 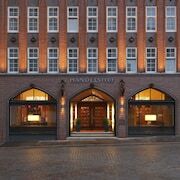 Park Inn by Radisson Lübeck is steps from Museum Holstentor, Atlantic Hotel Luebeck is convenient for Buddenbrook House (the setting for Thomas Mann’s famous novel), and there are lots of great options for hotels near European Hansemuseum, a high-tech immersive museum experience that was opened in 2015. You can take a jaunt on the river to the genteel seaside resort of Travemünde, but you might prefer to base yourself in one of Luebeck’s beach hotels and make day trips into the hustle and bustle of the historic city centre. The old town is hemmed in by the River Trave and there are lots of romantic riverside lanes to stroll beside. If you really want to push the boat out, book a room with a river view at the Radisson Blu Senator Hotel – it also has a swimming pool and sauna. Other hotels with a pool in Luebeck are a little further out. Couples who are interested in taking in some of the cultural sights should consider accommodation near Luebeck’s museums dotted around the old town – although space is at a premium in old Luebeck, so if you’re driving then choose a hotel with parking in Luebeck, all of which are outside the old town gates. A German Christmas market is a fairy-tale festive must-do and from the end of November Luebeck has no less than seven traditional Christmas markets on the go. Book a hotel near Luebeck Christmas market and enjoy roasted chestnuts, open fires, twinkling Christmas trees and (often) a sprinkling of snow. 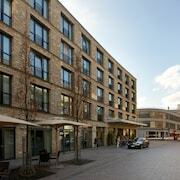 A stay in a spa hotel in Luebeck will make your visit here even more special. There's an elegant feel to Luebeck and hotels in the old town tend to be in heritage buildings; Klassik Altstadt Hotel is packed with character and reflects the wealth of this Hanseatic city – you’ll find the largest number of historic hotels in Luebeck in the mid-range and luxury categories. There are also loads of family-friendly hotels in Luebeck, as well as in Travemünde, the Baltic seaside resort 12 miles (20km) north. 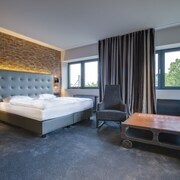 As for business hotels in Luebeck, there are plenty of rooms available whatever your budget – the ibis Luebeck is a great choice for clean and comfortable budget accommodation just outside the city centre. If Luebeck sounds a little sleepy for you then you might enjoy a livelier break staying in a hotel in Hamburg. Or perhaps you’d prefer to stay in a hotel in Timmendorfer Strand, nearby on north Germany’s coast. Explore Luebeck with Expedia's Travel Guides to find the best flights, cars, holiday packages and more!